Volume One of the Pinan Flow System released! Another book on the Heian / Pinan kata? I wrote my first book on the Heian / Pinan kata in 2004. Between that and the publication of the book in 2007 lay transplant failure, dialysis, and the gift of a second transplant – all factors that slowed me down but increased my appreciation of how good karate can be for the weaker person. So why have I written another book, and not just one book, a whole series on the Heian / Pinan kata? Over the last ten years the research and training methods that I’ve adopted have changed my karate practice considerably. Through the investment I made in developing scenario training I’ve had the privilege of learning from watching large numbers martial artists face HAOV outside the comfort of the normal training environment. The process has been helped by the diversity of participants: from fit young aspiring martial artists to normal hard training middle aged men and women, and even young teenage boys and girls, all of whom have enabled us to create a variety of realistic and emotionally distracting challenges. In those simulations I’ve observed how people have accessed or failed to use their training in more realistic conditions. Confined spaces, close ranges, doorways, furniture, verbal and visual and physical distractions from other people, trying to deescalate a situation, trying to shield or rescue a child or perceived weaker individual, having limited peripheral vision or not being aware of a situation until after it has begun: these have all put participants’ ability to access their physical training and knowledge to the test, whether their training base was Shotokan, Goju, Wado, DART, Ju Jitsu, Krav Maga, MT, TKD, Boxing, Kickboxing, BJJ, MMA, or some obscure CMA, and whether they were 6th Dan, 5th Dan, 3rd Dan, Coaches or kyu grade students, or experienced LEOs, security or military personnel. The successful tactics, when the participants were able to access their skill sets, were relatively diverse, but what brought them all together was the similarity of their responses when things didn’t go to plan, and both how and when things didn’t go to plan. 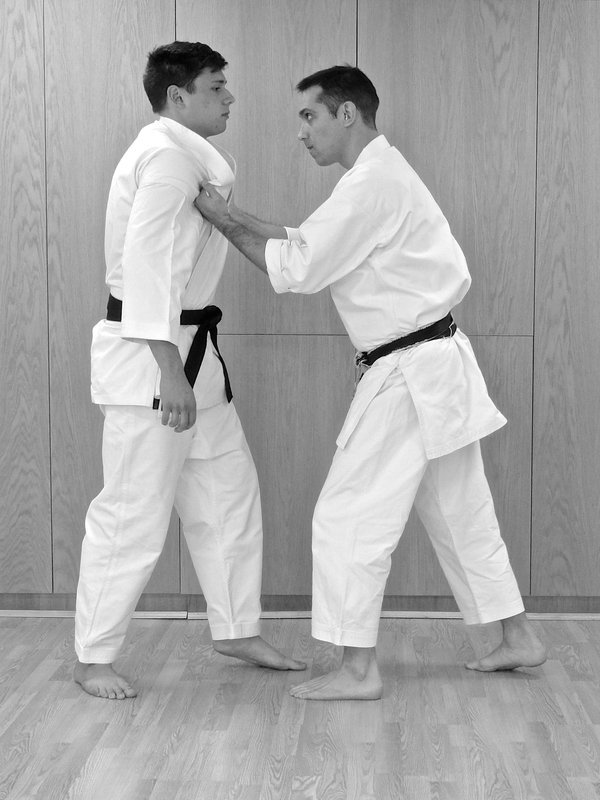 What is consistently visible in the footage of these events is that successful navigation and extraction of participants from the close quarter fighting comes not through accessing their well drilled kumite combinations, but through movements and stances that more closely resemble the strategies that are shown in karate kata, even amongst those participants who have no martial arts experience. In fact if I were to edit out the aggressors from the videos so that it appeared as if the trainees were fighting thin air, then the resulting movements would look more akin to a kata than anything else seen in the martial arts. I wanted to share what I’ve learned with a broader audience than I can possibly reach through travelling round the world teaching seminars, and the logical next step was to try and condense my findings into more books. In doing so I wanted write something that appealed not only to the experienced black belt looking for greater depth and practicality from their practice, but was also suitable for the complete beginner in karate trying to make sense of the funny movements he was learning in class, and that an instructor could safely teach to beginners. For me the Pinan / Heian kata represent a comprehensive catalogue of the interlinking strategies and approaches I’ve seen work under pressure. The majority of these are found in other forms, but the Pinan are the perfect vehicle for spreading the word on how effective basic karate can be because as a set they are simple, taught to beginners in many systems, and practised by karateka at all levels of their training. The practical defences against HAOV and the strategies from common less desirable positions that I’ve set out in these books are not complicated, in fact they are deceptively simple and easy. Almost everything that is combat effective is simple and brought down to the bare essentials of movement. I hope you have as much fun reading the books and trying the drills as I’ve had writing and training for them. I’m really excited to be able to release the first in the series covering Pinan / Heian Shodan and Nidan in both paperback and ebook. I intend to have all four volumes in the series published this year and I’m up for travelling to teach in person at any club that’s interested. You can buy the new book on amazon. If you have a local store that you like to use they’ll be able to get a copy for you too. Good to hear from you Graham. Your students are always welcome! I’m in the process of organising some more training days for interested Krav Maga and Kickboxing groups so I’ll keep you in the loop. Rory Miller is always an interesting read.